I bought mine the end of May when they were $50 off which made it as cheap as any of the other I was looking at and it was a done package unlike many of the others. Though some of the others, like OpenSprinker options, looked like they might do more IF you can put in the time. For instance you will probably want to mount it outside which means getting a water proof case. You can get the Rachio Outdoor Enclosure, for 2nd Generation Sprinkler Controller for the Rachio but will need to use something generic for OpenSprinkler like Orbit 57095 Sprinkler System Weather-Resistant Outdoor-Mounted Controller Timer Box Cover. You will also need from valves and a manifold. You can go with something mostly preassembled like Orbit 57253 3-Valve Heavy Duty Preassembled Manifold but the downside of this is the valves have connectors that are proprietary so you are locked in. I went with Orbit 57280 Female Pipe Threaded Auto Inline Sprinkler Valve, 3/4" that left all my options open down the road. I also used unions to make them simple to swap out. I also added a dump valve at the bottom so I can easily drain the system in the winter. In the end 4 zone's worth of plumbing will set you back another $150 or so. There is a ton of info here. The calendar shows the days it is planning on watering, weather info, several types of histories and your zones. 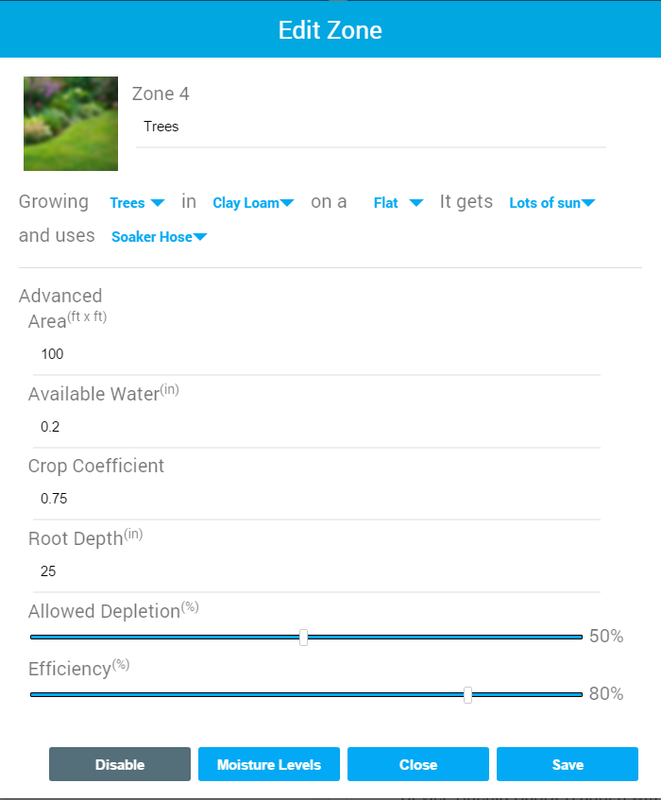 clicking on a zone lets you set a bunch of parameters to dial in the best water usage calculations. Note it only calculates water savings with fixed schedules with weather intelligence enabled. Flex gives you the best saving and moisture optimization but it also kind of makes it hard to compare since it has no idea what your old schedule was. What you need to do is look at how much water you are using per minute in the watering history. In my case that appears to be about 2.15 gallons per minute (my zone 4 uses about 1/3 the gallons/minute the others do but lets keep it simple). Say my old system watered each zone for 10 minutes a day every other day. So at the end of 8 days it watered for 40 minutes times 4 days or 160 minutes. At the end of 8 days you can see how many minutes it watered, take the difference and multiple that times you gallons/minute to see what you saved. Granted it would be nice if they let you input that in your preferences so they could calculate it for you. You can even add a customized sprinkler type. I found the Precip Rate for a soaker hose in one of the forums. 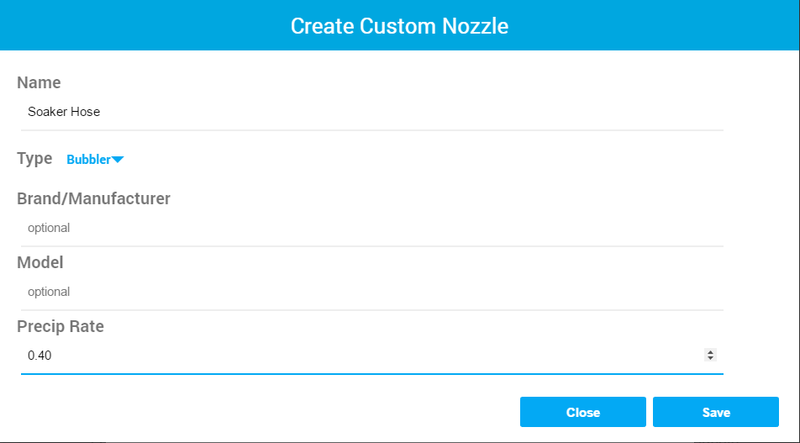 Note it appears you can only edit a Custom Nozzle via the phone app and can not remove them in either interface. Otherwise the phone app has similar functionality though the layout is different. One thing I should point out is the blue icon in the lower right. This brings up a remote for manual control. This is mainly useful in the phone app for testing and turning off the sprinklers when you are in the garden doing stuff. Why would I want this over a simple timer setup? The big thing is Flex watering that takes weather, soil type, sprinkler type and area covered into account. 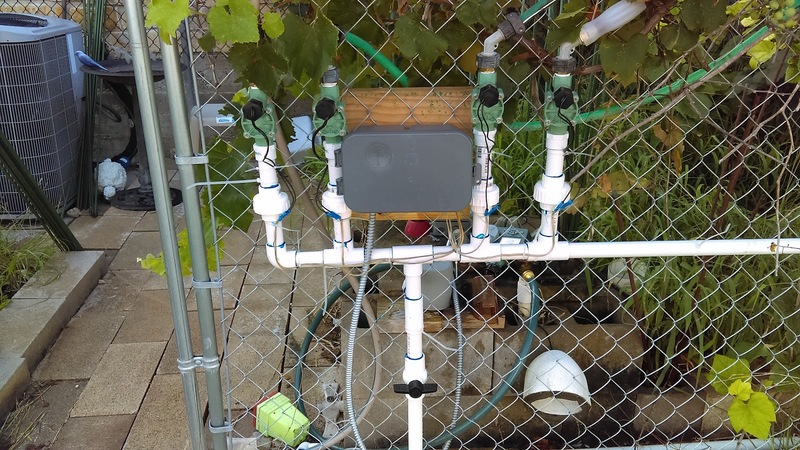 Instead of watering a zone for a set amount of time then the next, it calculates how much water should be needed given all the factors them divides that into sub cycles and rotates watering the zones to reduce run off. This might make getting accidentally hit by unexpected watering more likely but should reduce water usage and keep the plants at optimal moisture levels. Then there are all the integrations. The official list is here. First off you can link into a near by PWS weather station. If you have one that can upload data to PWS Weather you can tie it straight in. For instance for Netatmo or if you have a Meteobridge. I have my Meteobridge connect Davis Vue linked. They suggest using a pro station near by but out here in the hills that station could be flooding while I'm bone dry and vice versa. There were a few personal stations within a mile or so of me but since I have 3 weather stations online I know how accurate mine are being. Alexa has a skill to talk directly to it so you can override the watering. With flex watering this can come in real handy. It also supports Google Home. It talks to Nest which it is supposed to turn on the sprinklers if your Nest Protect senses a fire. Of course there is IFTTT integration which lets you talk to lots of things. Homeseer can talk to it directly with the ultrarachio3 HSPI plugin. 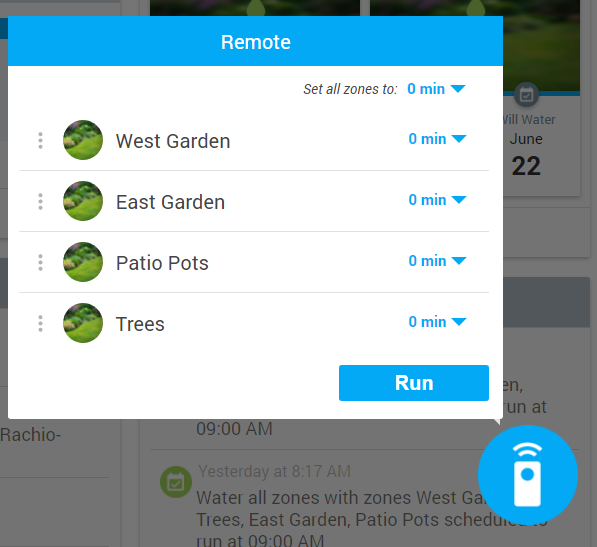 The plugin creates 55 devices (with 8 zone Rachio) that lets you monitor and control everything. Note triggering a Homeseer event via IFTTT versus this plugin appears to be about 10 minutes behind the plugin. So the plugin might well be telling you that watering has stopped before IFTTT has told you is has begun. It also talks directly to SmartThings. Detailed instruction for that can be found here. I'm not seeing anyway to make it work Vera. It is a Wi-Fi interface though so that is pretty much expected. Same goes for the closed Lowes Iris system. Rachio does have a public API though so you could probably cook your own if you have the time. Next step move my Davis soil moisture sensors to match the new zones and get the main unit better sun exposure. That will let me better tweak the settings and monitor for problems.